Ever since I was given a wee blue exercise book and told to record the books I read way back in primary school I've liked to keep a note of what I've read. This year I thought I'd add a list to my blog after I started to lose track a bit. I remember my A-Level English teacher lamenting over the lack of time to read for pleasure and, having had that moment of realisation a few years ago at about midnight with my head stuck in a pile of marking, I am still very happy with not being a full time teacher anymore! So over the year I'll be adding to the list which should appear in the sidebar, there might be a review, there might not. Thanks to Nics Knots I discovered Green Metropolis - "where books grow trees", and will try to link each book to a listing there where possible, so, if your fancy is tickled, you can go buy a copy. 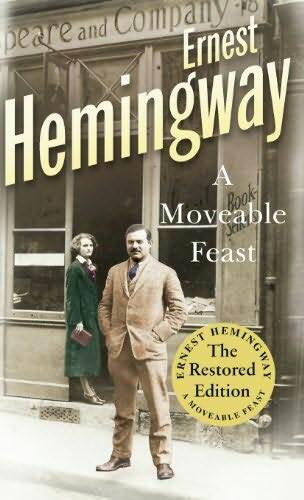 First read of 2010 then for me is A Moveable Feast, Ernest Hemmingway's memories of living in Paris as a young, unknown writer in the 1920s. An atmospheric, tender and witty portrayal of Hemmingway when he was young, happy, poor and in love with his wife.